Stephen Colbert called me "smoking hot"
We were let into the lobby at 5:30, where we waited until they were ready to seat us. 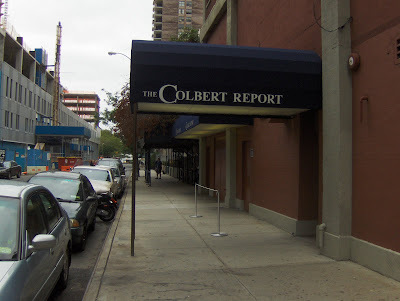 Thankfully they had old Colbert clips playing so it wasn’t totally boring. Around 6:30 they seated us, and I had a great seat. You can see me when they pan to the audience – I’m in the middle section five rows back wearing a bright blue shirt. Unfortunately we weren’t allowed to take any photos or have him autograph anything. Colbert: I’m afraid I don’t quite remember what that was. …Wait, was that you? Me: Yes, that was me! And having you talk about me on your show was about the most awesome thing ever. Colbert: Remind me what it was about. Me: An Iranian cleric said immodestly dressed women cause earthquakes, and I said we should test that scientifically. And it kind of took off like crazy, well, I guess which is why it was on your show. Colbert: And what did you wear that day? Me: Uh, oh, something similar to this I guess. Colbert: Now, now, young lady, I think it was a little less than that. You do look smoking hot though. Colbert: And wasn’t there an earthquake that day? Me: Yes, in Taiwan. But it wasn’t statistically significant! Colbert: *pauses and smiles* Don’t underestimate yourself, you look good. And then he moved on. And the gal sitting next to me said she loved boobquake. The show itself was absolutely hilarious. I’m sure you can look on their website, but it included the “Ground Zero Mosque,” Iranian politics, social media, religious jokes, and people riding dinosaurs. It was like it was tailor made for me. Her: That’s so awesome having Stephen Colbert do a piece on you. Can it get any better than that? Me: I used to think not, but yes, it can. Stephen Colbert just called me smoking hot. I can think of no better end to this New York vacation. I just can’t make stuff like this up (Nikki can confirm). Now if you’ll excuse me, I’m going to go die of glee. 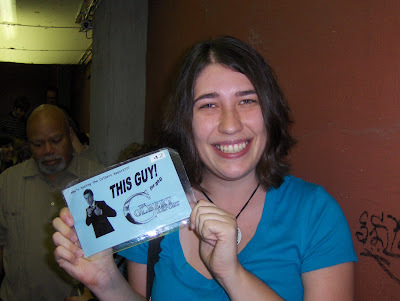 Previous postGuess who's about to go see the Colbert Report live?! Next postMy big photoshoot!